Use the Search button like Google - just type anything that you would like to "Search" on the Yuukan Website. It will be able to search anything that is on this website. Why don't you GIVE IT A GO..
Judo is a great way to learn a martial art and also a skill for life. Yuukan Judo Club was started in 2009 by The Nolan and The Gautier family. With Sensei Chris a current Sho Dan and NCAS qualified Coach and Blake Nolan and Riley Nolan as his junior assistants. Yuukan is a fun environment to learn a martial art. The club encourages and welcomes everyone who would like to learn judo from as young as five years to the more mature aged. 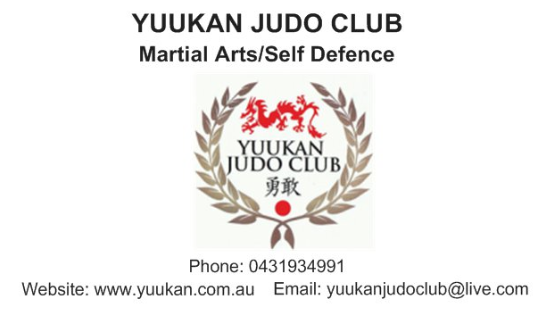 Although Yuukan Judo Club is a small organisation taking approximately 30 students per term, It is affiliated with the Australian Kodokan. Yuukan has experienced a number of successes with representatives taking out silver at Oceanias, gold, silver and bronze medals at the Australian National Judo Titles and numerous state representatives titles. Yuukan Judo Club compete at many tournaments within NSW, with IJF referring rules Our member, Blake, was the first ever junior male in Judo NSW who was awarded the Junior Gold referees certificate. Members also travel interstate for tournaments and they are ranked high against their peers and other judo clubs within Australia. It is a requirement for Yuukan Judo Club to be registered and insured with AKJA which allows our members to compete and be covered in Australia and overseas. ﻿Members have been blessed with community support with donations and sponsorships when we have raffles and fundraisers. Our club prides itself in being a family based organisation and promotes “Judo Spirit”, that is, respect, courage, inner strength and discipline and aims to provide a safe, fun, healthy and positive sporting environment..
© 2013 Yuukan Judo Club, All rights reserved. Photos and information managed by - Volunteers of Yuukan Judo Club.